Get the latest offers and discounts from MuscleFood sent direct to your inbox. Yes, I confirm that I am 18 years of Age or older. Nutritional information guideline only – view disclaimer. Unbelievably juicy, succulent and downright tasty, our extra lean chicken breast fillets are a fridge must have! Each breast weighs in at an impressive 200-250g meaning you will receive 20-25 fillets per 5kg pack. This is up to DOUBLE the size of a typical supermarket 125g chicken breast, so in essence our 5kg is equivalent to 40 x 125g supermarket breasts! Plus, because our breasts arrive with you fresh in a gas-flushed tub, you can separate your fillets into freezer bags and freeze for that perfect protein portion every time. We only source our brilliant chicken with no added water or salt, you’re guaranteed perfectly plump, chunky, delicious chicken fillets that don’t shrink in the pan. 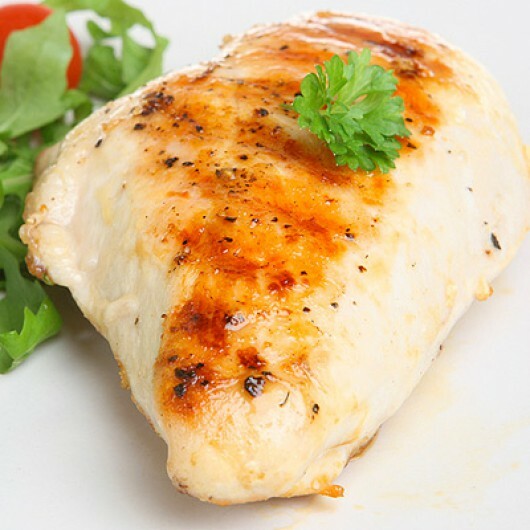 - 5kg of 250g Chicken Breasts packed in pairs, just £29.95 - View product. - 5kg of 125g Chicken Breasts packed in pairs, just £35.00 - View product. Hand-trimmed, no added salt, no added water and no cheap inner fillet. You can receive up to 50g (20%) more, simply by us cutting off the fat, blood spots and cartilage compared to other sellers. Reviews are usually verified within 24 hours. Buy 1 Hamper Get 2 FREE! Extra Lean Free Range Diced Beef A Customer Favourite! Less Than £1 Per Bar! Try 6 Today For JUST £9.95! Fancy offers, recipes and new product releases? Enter your email address below and we will send them direct to your inbox every week! Want £5 off your first order? Sign up today free and get £5 off your first order! Plus, you will be first to hear about new products and the best offers! Minimum spend of £60 applies.